Omnibus films appears to be one of the latest in things in world cinema. By omnibus, I mean a collection of films, however short or long, patched together into one package and released all together at once as one product. It can make for an interesting bit of collaboration, as can be witnessed by the popular incarnations of the Love omnibus series, like ‘Paris, je t’aime’ and the upcoming ‘New York, I Love You’. Coming a little closer to home, we’ve seen the likes of ’15 Malaysia’ doing its bit, while Japan has the triumvirate of Bong Joon-ho, Michel Gondry and taking over the reins for the Tokyo omnibus project called…err, ‘Tokyo!’. Not to be outdone, Pen-Ek Ratanaruang and his buddies got together, and decided to say hello to ‘Sawasdee, Bangkok’. Not that it’s the only trend around, of course. Much like Philippino films being in demand pretty much in film festivals across the world (not unlike the Romanians a few years back), I think it won’t be too long before it passes over sooner rather than later. Nevertheless, it does present an exciting alternative. In a way, you get to see how people adapt to the challenge, if you are familiar enough with their works. Put it this way; in some ways, telling a story in feature films is much easier compared to short films, because of the time afforded to you. You’d get an average running time of over an hour, versus the more standard twenty-minutes-or-less format that floats around in the short film genre. Some, of course, go beyond this, and the final definition has never been truly decided. Nevertheless, telling what is essentially an exciting story in twenty minutes is a challenge all on its own, and one I am still trying to get my head around. Designers made new Goth coats with the swine flu in mind. In the case of ‘KILL’, however, it must be said that I am not entirely familiar with the director’s working on the four films. The director of photography for the films, however, is a Korean, Kim Sung-bok (he has done films like ‘Public Enemy’, ‘My Sassy Girl’ and the rather interesting ‘Silmido’). Watching those films, you know that he is a capable cinematographer, but any thoughts of him bringing over the styles or elements of styles from those films to this omnibus project is wild and off the mark. Perhaps off the mark we should get. Basically, the one element that ties the films together is a sword. This project is a collection of short films made by four directors. They’re led by Mamoru Oshii, a renowned animation director in his own right, who linked all the films together by way of its “sword” theme. 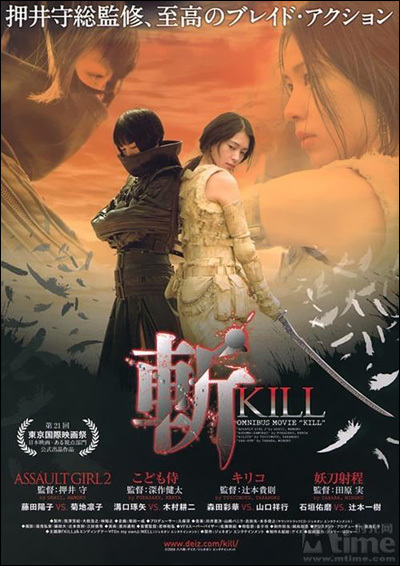 In the first film, ‘Kiliko’, directed by Takanori Tsujimoto, tells the story of Kiliko (Ayako Morita) seeking revenge for her sister’s kidnapping. She finds her way into the lair of the evil-doers, and starts to fight her way through with her sword. 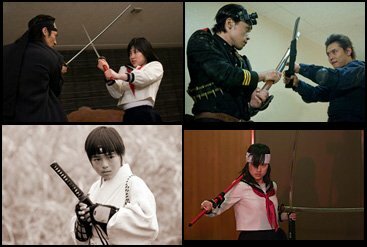 It plays itself out almost like a video game, as she scythes down the mini-goons before having the chance to take on the big bad boss himself (played by Yoshiyuki Yamaguchi). It’s followed up by Kenta Fukasaku’s ‘Kodomo Samurai’, which follows almost a classic form of narration, but with…kids. Ryutaro (Takuya Mizoguchi), had a father who was a samurai. He taught him the way of the samurai, but warned him that no matter what, he is not to draw the sword left to him. Agreeing with such pacifist values, it is the stance he adopts until he himself is transferred to a new school. Making new friends, he witnesses the unjustices meted out by the bullies of the school, and slowly, but sure, the drama builds up into a “will he? Won’t he” dilemma of taking the sword and fighting for what’s good. See what I mean by classic? The fact that it’s played out with kids adds a little twist to the format, which already stands out by itself due to the director’s choice, helped along by the silent film and benshi (live narrator of silent films in Japan). The 2009 Sword Exhibition was a one-man show. Straying slightly off the course of swords is Minoru Tahara’s ‘Zan-Gun’, which takes the action genre and applies it to a story about a military force haunted by a sword. We start with a late 19th century soldier (Kazuki Tsugimoto) who comes across a pair of swords in the middle of the forest. He somehow merged his rifle with the longer of the pair…and becomes super evil as a result. Fast forward to the present time, a similar situation occurs, with a Special Assault Team searching for a serial killer. One of the assault team members (Yuma Ishigaki) comes across the shorter of the sword, and becomes the good of the two. The two of them (the assault team member and the old, immortal soldier who turns out to be the serial killer) finally meets and duels with one another. Finishing up with the same theme of good and evil once again, Mamoru Oshii visualises the same concept not with the weapons, but with two different angels. It’s called ‘Assault Girl 2’, because apparent he did another short film called ‘Assault Girl’ in another omnibus film somewhere. Laced with Biblical undertones (angels with wings, anyone? ), the music video-like product sees a white angel (Yoko Fujita) sitting and chilling amongst the tall grass in the fields. 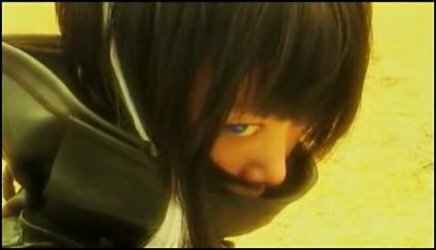 She flicks her eyes up, and works her way towards the dark angel (Rinko Kikuchi, in the first turn I’ve seen her in since ‘Babel’). Out of all of the films here, this is one that really takes the cake: character development? What character? There’s practically no narrative here, but what we do get is a very, very, very cool fight scene between the two. That, of course, was the extreme of the four films on offer. The first three at least bore some resemblance of trying to explain the motivations of the character, to create some sort of narrative that can be followed easily. Thus, there was a lot of reliance, I noticed, on the staples of the respective genres. Nowhere was this more obvious than in ‘Kodomo Samurai’, which mixed both the staples of children and samurai films. Funnily enough, the director appears to be trying to lull us into a false sense of security, because, with my guards down (“Oh, look, the kids are so cute!”) some adult aspects were tackled in rather adult ways. I lay this more with the fighting part; for some reason, images of kids messing around with swords is not a comfortable one for me. It reminds me of the child soldiers in ‘Blood Diamond’ or even the ’24: Redemption’ movie. But lull me it did, and it might do the same for you as well. from the flowery period dialogue to the headlong action scenes. The Japanese version of 24 took things to the next level. A similar take can be made of the first film, ‘Kiliko’. Helped along by the attractive girl swinging her big, phallic sword around, there’s a sense that the film itself is somewhat incomplete, like it’s a scene taken right from the middle of a film somewhere. Watching the first segment, then, it makes you feel like you want to watch the whole of that film, because with a little bit more care and nourishment, it would stand well on its own two feet as a film. A B-grade film, with cheesy effects, but, with ‘I Sell The Dead’ relatively fresh in my mind, I find myself wanting to watch more and more cheesy films these days. I am not sure why; maybe it’s just that time of the month for me. 🙂 As a result, such cheesiness and lays down well with my stomach. Top marks must also be given to the editing, as well as the cinematography, because it really added so much energy to the final product. It was clearly digital, which distracted me, somewhat (low resolution TV-like digital films doesn’t do well with me on big screens in big cinemas). Energetic could also be described for the third film, ‘Zan-gun’. Quite frankly, it’s probably the most ridiculous of the lot. I mean…swords…and guns? Reading the synopsis before the screening, I was metaphorically scratching my head. But it works well, somehow. The sword and the gun merged together into one singular weapon of choice, it allows for the two characters to fight each pretty much from an arm’s length to somewhere from across the room. They’d cut their rifles across like swords, which would then fire the bullets. They’d cancel the bullets with their own shots, and, as Brian McKnight used to croon, started back at one. That was basically the whole show. Cool shots, cool angles, rinse and repeat over and over again, as the climax becomes a matter of not finding out who lives, but which one of the two is the coolest at flinging their rifles about. It’s all rather brilliant, actually. The fight for the last sushi was intense. Brilliance could also be applied to the final film, ‘Assault Girl 2’. See what I wrote for the previous three films? See what I said earlier about the lack of even the most rudimentary of basic plot? Oshii clearly wants to play with the themes, rather than the details of the stories that usually serve as the context. Take all that out. Get two angels together, and let them fight to the end. The shortest of the lot, it is also the most intriguing of them all as well. I find myself filling the holes with my own references. Where did they come from? How did they get here? What is their wants, needs, purposes and desires? You might get that from the first ‘Assault Girl’ film, but you won’t get it here. However, I find myself subconsciously thinking about that as I watched the cool, cool action on the screen. That’s the one thing that we can’t argue about the Japanese: they know how to fling their swords. All of this leads to a rather pointless collection of films. When I say pointless, I mean that there is little purpose in creating something that the audience that have an affinity with. It’s not about logically winning them over, but, as I realised, about trying to create as cool a product as possible. It really is very cool, and I have to say, that it may well be that time of the month for me. But pointless films that have excellent editing, energy, and visual attraction makes it all worthwhile. If ever you feel like sitting back, looking up, and just going, “Fuyoh! Best giler!”, then ‘KILL’ is the best way to ‘kill’ some time. Who needs love when you can have pretty girls cutting up World War I tanks with their sword?